I truly hope that doesn't sound familiar, but I'm betting for many of you, it does. How do I know this? Hon, I have been there. January is THE WORST. Years ago, I dubbed the first day back to school in January as "The Worst Day of the Year." Things have definitely improved for me the longer I teach, but yeah, that's still my pet name for January-the-whateverth. I have a challenge for you over the holiday break: make a plan to make it better. If you are already feeling anxious about January, perhaps it is time for a change. One that makes your students more independent and frees up some of your time. So you can breathe. So you can relax a bit and enjoy your kids. So you can pee during the school day. Here's the plan: start the new year with a new, easy-on-you plan for library centers. Students will love the autonomy, and you will love the minimal prep and more peaceful library time. Before I became a middle school librarian, I was an elementary librarian "on the rotation." And it was hard. Really, really hard. I was VERY lucky at the time and had a full-time library assistant, but that is no longer in place at my former school. All the assistants in our district got cut in 2011, and the positions have not been restored. Before school The library was open as an option for all 2nd-5th graders. We were a POPULAR option, with maybe 60 or students in the library on any given day. Once they chose the library, they were expected to stay there. Checkout was only allowed in the last 10 minutes; from 7:30-7:50, students were supposed to find a book and read quietly. 7:50-8:45 Open checkout. This was also considered my (non-existent, completely useless) planning time. I also had to laminate all items for all teachers in the building, shelve books, and help students, teachers, and parents who came in for checkout. 8:50-11:30 I saw 5th grade, 4th grade, and 3rd grade for 50 minutes each, with 5 minutes in between each class. The third grade group was extra-large, so I had about 32 students in all my third grade classes. The rest of the classes had about 25 students. 11:30-12:00 Lunch. I wolfed down my lunch and attempted to shelve a few books before the Kindergarteners came in. My aide had lunch duty at this time, which meant she took her lunch while I had Kindergarten in the library. 12:00-2:40 Kindergarten, then first grade, then second grade in 50-minute increments with 5-minutes in between. Kinders and second grade classes had about 20-22 students. Like third grade, first grade was also doubled-up for specials, so I had about 27-30 students in my first grade classes. 2:40-3:00 Mad shelving party. I barely made a dent. 3:00-3:15 School ended at 3:00, and I had bus duty after school. 3:15-4:30 Mad shelving party, meetings, helping teachers and parents with checkouts, dealing with random students whose parents were "somewhere" in the building, getting ready for tomorrow. I could have stayed until midnight and still not finished, but I had to leave by 4:40 to pick up my children from daycare. And so it went, 5 days a week. As I'm sure many of you know, this schedule was really, really tough. My routine with the little ones (K-2) was a 30-minute storytime and a 20-minute checkout and read quietly. I quickly discovered that the "read quietly" part didn't work so well as I had hoped. Before long, "read quietly" became a longer storytime or library lesson, translating into more planning for me. The older students (grades 3-5) had a 20-30 minute library skills lesson, booktalk, or read-aloud. They then had 20-30 minutes to check out and read quietly. Again, "reading quietly" meant different things for different students. No matter the age group, for some students, "read quietly" meant chat with your friends, play hide-and-seek in the stacks, jump into the beanbags, ask for a restroom break, or generally wander around aimlessly. Nothing I did seemed to help much with behavior at this time. If I didn't fully entertain the students for the full library lesson, some classes devolved into chaos. By the end of the first semester, I was completely D.O.N.E. I was seriously considering going back into the middle school classroom as an English teacher. At least as a teacher, I had the same students--my kids--every day. I could train them with consistent classroom expectations and, when necessary, meetings with parents. My students would know me, and I would know them. Some days were full-on, but other days were more relaxed. Sometimes, the students had tests or days where they worked on projects. I wasn't "on" constantly. Plus, I had my English Department and the 7th grade team behind me when I needed them. I didn't have to entertain every single minute of every single day. I knew all my students' names by the end of the first week. Classroom teaching wasn't perfect, but it was most definitely less frazzled. As a librarian, every minute of every day was full-on. I felt like I was shot out of a cannon every morning, only to land somewhere near my bed (or the couch) by 9pm. As a mom of a baby and a preschooler on top of it all, I felt disorganized, overwhelmed, and utterly EXHAUSTED. I didn't even have time to stop and have a good cry. Something had to give. Over Christmas holidays that year, I came up with a new plan. I needed students to be much more independent. I needed time to shelve a few books throughout my day. I needed lessons and activities that my students could do without my constant supervision. We all needed structure and routine. Enter centers! When I look back on that year, and I truly believe centers changed my library life. It is quite possible that implementing centers got me through that school year with my sanity intact. The students caught on quickly, and I never did go back to teaching middle school (though I did become a middle school librarian the first chance I got). Centers are very common in elementary classrooms. I have seen elementary teachers who picked up their students from library time, and when they say the class was going back to do centers, the kids were so excited. My own kids love centers. Centers are great for giving students freedom of choice and exploration. Best of all, they take minimal set-up on the teacher's part. Below is a list of centers I have used with elementary and middle school students. Middle school centers look a bit different since I do not see the classes every week. In middle school, my centers are for before and after school, as well as during our students' break and lunch times. At my previous elementary school, we had six 6-week grading periods, so I changed out the centers every six weeks. I had two groups of centers: upper-elementary (grades 3-5) and lower-elementary (grades K-2). Some of the centers were the same, and some needed to be switched out at lunchtime for my little ones in the afternoon. The little ones were assigned to a different center each week. I put students into groups of four, and students had the choice of their assigned weekly center or independent reading time. I did have to be very clear about independent reading time actually being spent reading. If your library is large, it may help to move the beanbag chairs into one area of the library for the little ones so you can better monitor them. Older students were allowed to choose centers freely. As with the little ones, independent reading was always a center choice. For all ages, once a center was chosen, the students were expected to stay in the center for the remainder of library time. If they finished their center early, their only choice was independent reading. If you get six games, you can rotate them into the game station every six weeks. I got most of my library games through parent donations and yard sales. PTA might also be willing to help you with purchasing games for your library. Games are great because they are inexpensive and relatively durable. Jenga is easy to learn but challenging to play. Students can play with 2-4 players, or they can play in teams. There is also Giant Jenga for extra-giant fun, but since this version is hardwood, I would say it's better for middle school than elementary. There are also many variations online (like this one) where you can write things on the blocks to make alternate versions of Jenga. Connect Four is great for all ages, and many of your students will know how to play. Even if they have never played before, the game is easy to learn, and it's always a hit with students. Giant Checkers! This reminds me of those giant Checkers games at Cracker Barrell! Yahtzee A classic that never gets old. We've played this with our boys for years, since they were maybe seven or eight. They love it! Apples to Apples Junior I've never played this one, but the Amazon reviews are very high. Ages 9+. Trouble Looking for something with less pieces to keep up with? Try this one! I've played Trouble at least 987 times in my life, both as a kid and as a parent. Always fun! Guess Who? Another game with very few pieces to manage. And another one that I played as a kid and as a parent! How cool is that? Harry Potter Trivial Pursuit My middle schoolers would go bonkers over this game! I definitely need to invest in one when I come home this summer. For elementary libraries, I would suggest starting small, at 100 or 300 pieces. I learned this the hard way when I tried a 1000-piece puzzle with 4th and 5th graders. 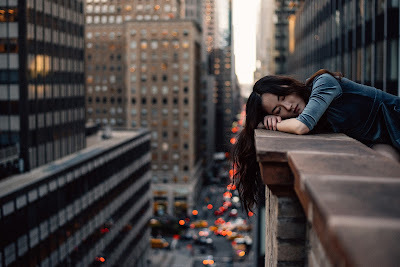 It was too hard for the majority of my students, and they lost interest quickly. I ended up offering several puzzle choices, from 25-pieces to 100-pieces, with a 300-piece group puzzle available in a different center. It surprised me that my fifth graders would choose the 25-piece puzzles. TIP: Use a paint stick to dab a bit of the same color on the back of each piece of a particular puzzle. This will help you find right pieces quickly if the puzzles get mixed. We bought this exact set of Tangrams for my son when he was about 3 or 4 years old. He LOVED them and completed the tangrams regularly up to about age 9. What an investment! Rush Hour is another game my puzzle-loving son played regularly for years and years! This does have some pieces to keep up with, but the game comes with a storage bag and a little drawer for the cards. It's small and great for travel! Because I had enough bean bags and floor rockers for every student, this center was always open to anyone who wanted to do it. On any given day, up to half of a class might choose this center. The main rule I had for the independent reading center was that students had to be actually reading if they were sitting in a beanbag or on a floor rocker. If they were chatting, they had to choose a different center for that day. Students were also allowed to read aloud with a friend as long as they read relatively quietly. These are very easy to maintain, but you will need to switch out the coloring books or sheets each week. Switch it up by rotating coloring bookmarks, different coloring books, dot-to-dots, and color-by-number. I've found that just covering the table with a huge sheet of butcher paper is fun for the students. Or, you could try one of these giant coloring pages. Older students love coloring, too! 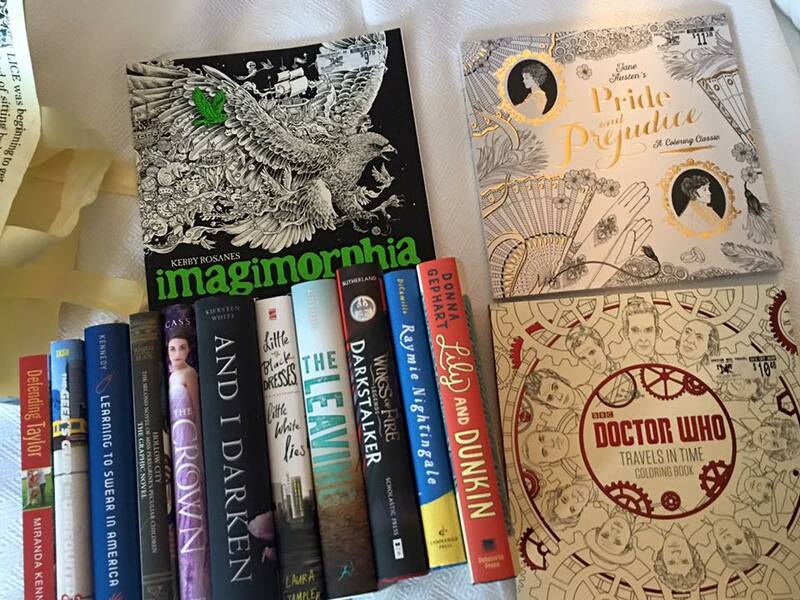 Thanks to the adult coloring book craze, there are tons of great YA-themed coloring books. I have several in my library: Dr. Who, Harry Potter, Pride and Prejudice, and Throne of Glass. I also have general geometric patterns and this gorgeous steampunk-inspired line art. 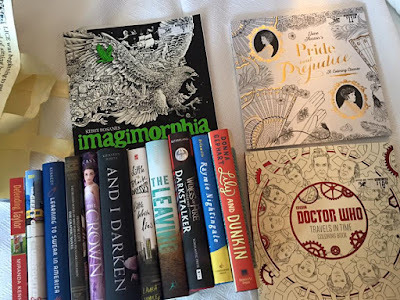 I want to get the Lunar Chronicles and Red Queen coloring books, too. Also, check out this Tattoo coloring book! AND...there is a new coloring book coming out for Kiera Cass's The Selection in late-December! My girls are going to flip when they see that! Bananagrams is kind of like Scrabble without a game board. It's great because the game board can be a bit tedious for little hands, and it's easy for the Scrabble tiles to shift on the board. Clean-up is a snap with the banana-shaped zippered cloth pouch. For younger students, try Appletters, Pairsinpairs, or My First Bananagrams. Silly Sentences is great for PreK and Kinders. Students use the cards to make up silly sentences. Each of the 124 cards is color-coded by part of speech (green=verb), so this game could also be used to teach grammar. A classic that my personal kids just played tonight! I really love the switch to eco-friendly whiteboards in this version. This maze book is better for younger students; according to the publisher, it's targeted to PreK-3rd grade. This 48-page book of mazes is better for older students or adults who want challenging mazes. This dot-to-dot book also contains color-by-number and mazes. Ages 4-8.. Extreme Dot-to-Dot! My 9-year old nephew absolutely loves these things! These are not the dot-to-dots we remember from school; they go up to 1000 dots or more. Great for older kids; frustrating for the little ones. What Do You Stand For?--This is a card Game for ages 7+. Created by a teacher, each card features a different "what would you do?" scenario for discussion or writing prompts. Personally, I would cover a table with white butcher paper and put out some colored pens. Students could write their responses on the butcher paper, and other students could read and respond. Math War Card Games. Because anything that will help with learning multiplication tables is going to make you a rockstar. Your math teachers will love you and bring you chocolate and coffee if you can help with the multiplication tables. Especially the 6s and 7s. We have played Uno as a family for years! Great for upper-elementary, and you will probably have some students who can teach the others how to play. Ages 8+. Snap Circuits and Snap Circuits Junior is like LEGOs meets electricity. Students can follow the instructions to create 101 different projects, or they can try to create their own circuit boards. Ages 8+. Makey-Makeys are super-cool, but they will require some instruction on your part. Basically, you can connect the Makey-Makey to any object, and it will function as a touchpad. For example, you can turn library books into piano keys. There are lots of videos online on how to use these. More about Makey-Makey--Show this video to your students, and let them figure it out! If you are lucky, you might be able to score a microscope or two from your school's science lab. It doesn't hurt to ask, right? And even if you can't have one permanently, perhaps you could borrow one or two of them for a couple of weeks while they are not in-use. Don't forget to ask for slides, too! Super Magnet Lab. I can remember being in fourth grade and being obsessed with our classroom magnet kit. I loved pushing the bars around by putting the like-sides together, and I remember trying to build magnet towers with all those little magnet chips. This kit has 124 pieces, so you'll definitely want to have an easy-to-use clean up system for the magnets. You might also want to talk to students about the dangers of ingesting magnets. Manufacturer suggests ages 5+, but the students should be old enough to not put magnets into their mouths. I'm not sure I would use this with students younger than about second grade. Playing with prisms is another activity I remember from elementary school. I loved playing with rainbows! This set contains six prisms of different shapes and sizes. Does your library have ipads? If so, the ipads make a GREAT center! There are so many apps to choose from, and whatever you use them for, the iPad Apps center will be very popular with your students. I personally love the FirstNews app (a school-wide subscription to the website and app downloads). We just got FirstNews this year, and it's been a huge hit with our elementary and middle school students and teachers. We use it every day! I also wrote an article about FirstNews videos here (the videos are free, even if you don't buy the app). Best 1-to-1 iPad Apps for Elementary. I personally prefer Follett playaways or digital audiobooks via OverDrive or Follett to the big listening center sets, but I also know many schools may have these listening centers available in the library. If you use these, you will also need audio CDs to play. Playaways and digital audiobooks are great though because students can check them out and listen at home. 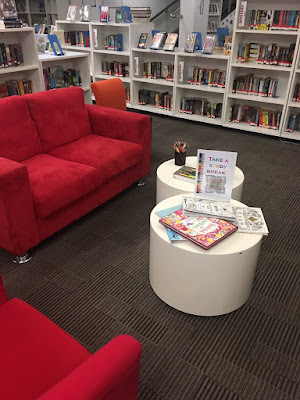 How do you use centers in your library? Do you think they make your library life so much easier? And seriously, could Christmas break possibly come any sooner? Thank you for sharing your centers ideas, Kathy! Centers were a game changer for me when I was in the elementary library. They made checkout time fun for everyone -- including me! Everyone was engaged in either looking for a book, reading, or working at a center of their choice. Great writeup on this, as usual! Thanks, Amanda! I think "game changer" is a great way to put it. It saved my sanity! You said you put younger students in groups of four and then let them choose centers...so you grouped students based on their choice or did they choose after being grouped? What was the procedure for the older students? Did you let students repeat centers and/or were they required to complete all of them? The younger students rotated centers each week. If I had time, they rotated centers twice in a library session (15 minutes each rotation). It really depended on what I did for the lesson and the centers that were set up for that day. The older students could drift from center to center as they pleased. I did not group them. Yes, there were some little spats from time to time about someone "hogging" a center or too many people in a center, but for the most part, they were pretty good about policing it themselves. If there is a problem with a particular class, you could always rotate the centers the same way as with the little ones. No requirements to complete all the centers. They were there for exploration and fun, not an assignment. There were plenty of students who chose independent reading instead of centers each week. Some of them never did a center because they just loved to read! Thank you for sharing! How do you introduce centers? I'm thinking about procedures here...students come in and need to exchange books, does that happen first? Then they can go on to centers? Or would they need to be part of the independent reading station in order to exchange books? I would love to do more centers. Unfortunately these won't work for. I have very specific "standards" I'm expected to teach in my media classes even with the kindergartners! It all involves technology and media literacy. I'm looking for center ideas for that! Any ideas???? I love the idea of a microscope center and the prisms center! There could be some really good research connections for interested students too, so they can apply information fluency skills in a hands-on way. Hi, I realize this is an old post, but I do have a question about shelving. When you have a series of books, such as Americas 50 states, and they all have different call numbers, do you assign them just one call dumber ? Do you reference them? Do you label the spine label with the author's name or the book series? Or do you just pull them and place them in the reference section for classroom use only> It drives me crazy that the books in the series have different call numbers, because when voulnteers shelve the books, I find them all over the place :( What suggestions would you have--any ideas are appreciated! 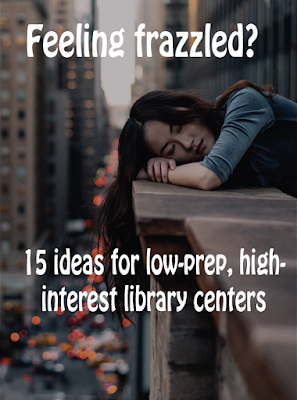 I'm a first-year librarians and I tried rotating through centers. My problem, and the reason we had to really scale back on them, is that every child wanted to use the 7 computers, or every child wanted to use the four beanbag chairs. They had to share and me classes handled it well. Others did not. How did you handle that happening? Welcome to the greatest career in the world! This is a great question and definitely something that has happened to me. At the elementary level, I rotated my students through centers. I changed out some of the centers every 6 weeks (games, puzzles, etc) and kept others the same (beanbag chairs, computers). Students rotated through them in six groups each week, so by the end, they all got an equal chance to do the centers. I would also suggest buying more beanbags, floor rockers, and other cozy seating if you are able. That's an easy center to maintain, and students love it. If you had, say 15 cozy chairs, students could rotate into these every other week. Eventually, I had enough beanbags and cozy chairs that I was able to make reading in the chairs a choice students could always choose to do if they didn't want to do their rotated center that week. I’m curious about how you organized the library space to accommodate the various centers. Between book stacks, a 30 desktop computer lab, tables and chairs to accommodate whole class, small groups and/or individual use, and a mobile Promethean board, I don’t know where I would put beanbags and cozy chairs or set up centers especially if I wanted to be able to keep an eye on everyone. Do you teach students, or primarily use centers? I know some librarians who allow students finished with their work to use centers, and I sometimes use them before vacations. Your post mentions grading periods, so I wonder how you grade students based on the centers listed. Do you teach a lesson and then use centers? Thank you. I would love to see pictures of your centers...signage...instructions...supply and game part storage. This is such a great idea for a future post! My centers photos now would have to be middle school centers since I'm no longer in elementary school, but I'm sure that would be very helpful. I will keep it in mind!